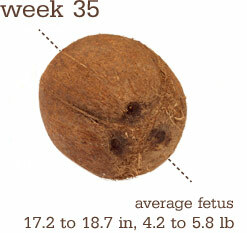 Baby’s about 17.2 to 18.7 inches and around 4.2 to 5.8 pounds. By week 35, these systems are all a go in baby: hearing is fully developed, the circulatory and musculoskeletal systems are complete and her lungs are mature. I was feeling kind of cruddy but the last 2 days I have felt better – less pressure and more comfortable in general, and at my prenatal appt today, we discovered that it was most likely because the baby has turned and is now breech! Stinker. I think I know when it happened, (although at the time I had no idea) but thinking back I can narrow it down, I’m pretty sure. 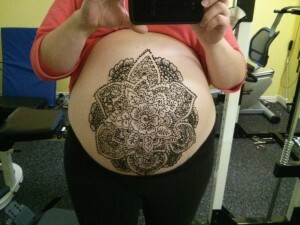 It’s not too big of a deal at this point…the baby has plenty of time and space to still flip back over and my midwife gave me some ideas of things to do that usually work to flip a breech baby. But I might enjoy another day or two of being more comfortable before I try any of those techniques. 2 of the midwives palpated around to confirm, and then we did a quick ultrasound that verified it. Although now that I am sitting here at the computer I would swear that I felt a good round of hiccups very down low…so, who knows? Maybe it was a temporary thing and he’s already decided he likes it better head down? I’m looking forward to that crazy feeling of pride every time a baby does or learns something new. I remember that so vividly..how the simplest thing could bring me to tears and make my heart swell all at the same time – I was just so proud. I mean, I still feel that with U, but it’s bigger things now…saying words, and accomplishing tasks, and all that. But with a baby, it’s so funny that a smile can give you that feeling…or holding his head steady for 5 or 10 seconds. Such small things…that have such an impact! I’m planning to take the car in for a inside and out wash and detail sometime in the next week. Then the infant car seat will go in, so that we’re ready. I’ve piled up all the stuff for the baby to take to the birth center, but still need to gather up all my stuff and actually put it all into a bag. U has a bag packed, too, so that in case we have to hand him off to a friend to watch for a while, he’ll be all set with clothes and toys and snacks. During the quick ultrasound that we did today to verify the baby is breech, the tech commented that it looked like he was going to have hair! That was kind of cool.